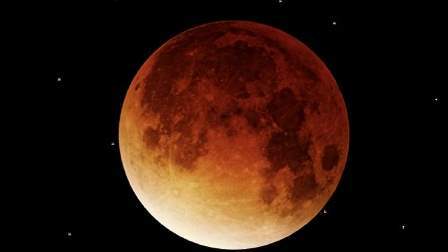 A cosmic event not seen in 36 years - a rare "super blood blue moon" - may be glimpsed January 31 in parts of western North America, Asia, the Middle East, Russia and Australia. The event is causing a buzz because it combines three unusual lunar events - an extra big super moon, a blue moon and a total lunar eclipse. "It's an astronomical trifecta," said Kelly Beatty, a senior editor at Sky and Telescope magazine. This full moon is also the third in a series of "supermoons," which happen when the moon is closest to Earth in its orbit. This point, called the perigee, makes the moon appear 14 percent larger and 30 percent brighter. During the eclipse, the moon will glide into Earth's shadow, gradually turning the white disk of light to orange or red. "That red light you see is sunlight that has skimmed and bent through Earth's atmosphere and continued on through space to the moon," said Alan MacRobert of Sky and Telescope magazine. "In other words, it's from all the sunrises and sunsets that ring the world at the moment." The alignment of the sun, moon and Earth will last one hour and 16 minutes, visible before dawn across the western United States and Canada. Those in the Middle East, Asia, eastern Russia, Australia and New Zealand should look for it in the evening, as the moon rises. Unlike a solar eclipse, this lunar eclipse can be safely viewed without protective eyewear. "We've had a lot of supermoons and we've had lunar eclipses, but it's rare that it also happens to be a blue moon," said Jason Aufdenberg, associate professor of physics and astronomy at Embry-Riddle Aeronautical University's campus in Daytona Beach, Florida. "All three of these cycles lining up is what makes this unusual," he added. "It's just a wonder to behold." According to Sky and Telescope magazine, "the last time a complete lunar cover-up took place on the second full moon of the month was December 30, 1982, at least as reckoned by local time in Europe, Africa, and western Asia - locations where the event could be seen." That event also occurred at the moon's orbital perigee, making it an extra bright supermoon. Aufdenberg said that by his calculations, the last time a supermoon, blue moon and total lunar eclipse all together were visible from the eastern United States was on May 31, 1844. "But on that date the moon was near apogee, its most distant point from Earth," it said. Lunar eclipses during a supermoon happen rather regularly. The last one was in September 2015. Supermoons can happen four to six times a year. The next supermoon lunar eclipse visible throughout all of the United States will be January 21, 2019 - though that one will not be a blue moon.